When some people get started with goats, they may overlook a very important aspect of their care by failing to provide free-choice, loose goat minerals. Even if they know goats need minerals, they may think that a block is okay or that any livestock minerals are good enough. They may think they should top dress the goats’ feed rather than having the minerals available all the time. Goats have been around forever, and no one buys minerals for wild goats, so why should you provide minerals for your goats? Because goats in the wild are not fenced in. They are free to range over thousands of acres looking for what they need. Goats in the wild live in desserts and mountains, not on the plains and prairies or feedlots. Goats never lived in the wild in Illinois because we don’t have what they need to thrive. And if we don’t provide them with minerals, they won’t thrive. Goats in the wild drink only rain water or water from creeks and lakes. They do not drink water that has been pumped up from 100 feet below the ground. Well water in many areas is high in sulfur, iron, or calcium, which inhibits the absorption of other minerals, such as copper, leading to deficiency. If you have well water, not only do you need to have a complete goat mineral available, but you may also need to provide additional copper supplementation. If goats become deficient in minerals, they will have a variety of issues. Copper deficient goats will have problems with infertility, miscarriage, failing to shed their winter coat, and loss of color in their coat. (Click here to see pictures of a buck who is copper deficient.) They will also have a much harder time dealing with parasites. Selenium deficient does may have birthing problems and not pass their placenta in a timely manner. They may give birth to kids with white muscle disease. Calcium deficient does won’t have strong uterine contractions in labor and may get milk fever after kidding. Zinc deficient goats lose hair in patches and foam at the mouth. This is just a sample of the problems you will see if your goats are not properly nourished. Why do goats need goat minerals? Different types of livestock have different nutritional needs. For example, sheep need very little copper, so if you give sheep minerals or “sheep and goat” minerals to goats, they will almost certainly become copper deficient. Because of the different needs of livestock, using an “all stock” mineral may lead to deficiencies because they tend to be very low in all minerals, so as not to cause toxicity of any mineral in any species. What form of goat minerals should I use? Can I use a block or a poured bucket? Goats have very soft tongues, unlike cows whose tongues are like sand paper. Blocks of minerals are very hard, and poured buckets are only a little softer. It can be difficult for some goats to get enough minerals from a block or a bucket. Loose minerals can be easily licked up. Although some people have had luck with blocks, I’ve heard of goats winding up with deficiencies. I’ve also heard of goats chipping a tooth as they desperately scraped the block with their teeth trying to get enough minerals. How do you feed goat minerals? 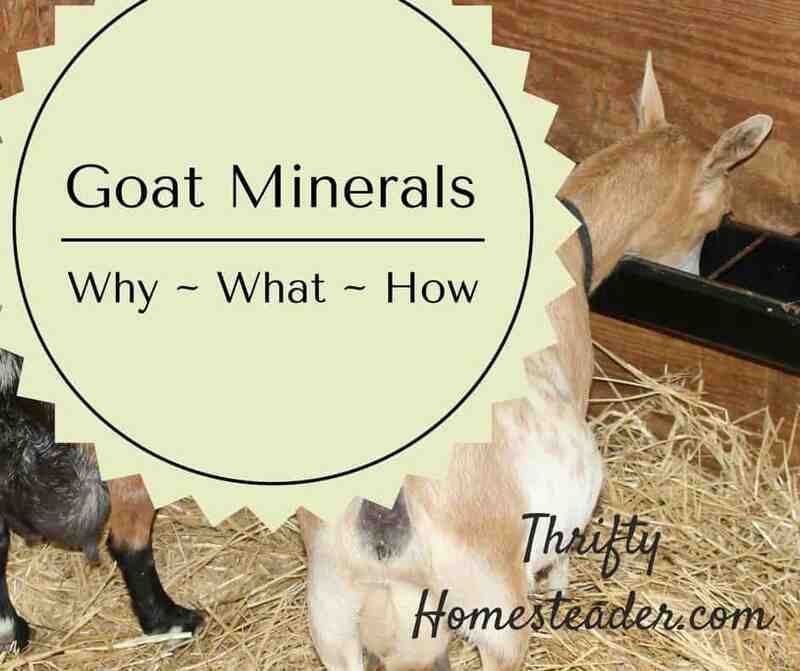 Goat minerals should be in a mineral feeder attached to the wall. It should be high enough so that the goats can’t poop in it. Since their head is at about the same level as their back end, some people will put a cinder block next to the mineral feeder so the goats can put their front hooves on it to reach the minerals. Do your best to make sure minerals are always available. Mineral needs may vary from goat to goat and day to day, and goats actually do a good job of consuming what they need. You should not mix in anything with the minerals! Some people want to add baking soda or diatomaceous earth or kelp, etc. If you want to provide additional supplements for your goats, they should be provided in separate containers. Minerals have been balanced by nutritionists (usually with salt) to regulate the goat’s intake. If you start mixing in other things, you will alter their consumption. For example, if you add baking soda or kelp, that will increase the sodium content, which will reduce the amount of minerals the goats consume. Although it may seem logical to equate goat minerals with a multi-vitamin for humans and assume that it’s not really important, nothing could be further from the truth. By following these tips, you can be sure that you are doing what you can to ensure that your goats are getting the minerals they need. 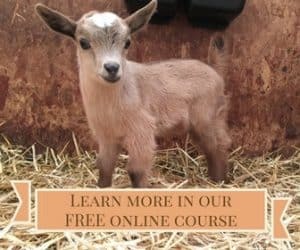 You can learn more about my free online course, Copper Deficiency in Goats, by clicking on the link. It includes live videos, PowerPoint lectures, and handouts. In researching how to raise our little Nigerian Dwarf Doelings naturally. I came across your site. And wanted to ask you about the copper supplements. We know several goat owners for market goats, but not any who raise theirs like we hope to care for ours. We would like to have as “clean” or natural as is prudent. Our does are 3 months old and get a free choice loose mineral. It does contain copper. They also get free choice broamy/grass hay along with ample graze in our wooded and pastured areas. And an organic dairy goat/kid pellet from Modesto Milling. Would you still recommend an added copper supplement? If so, how much, and how often. All of our goat friends follow the typical practices of raising goats so asking them isn’t really the advice we are seeking. Our goal is healthy girls, who can grow up to be strong mamas and have healthy babies. And we would love to have milk. 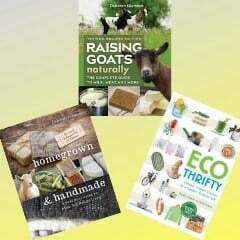 We are committed to their care, and I have the book you referenced on raising goats naturally, but asking someone in practice could be so helpful! Symptoms of copper deficiency include faded coat, balding around eyes or on bridge of nose, a fishtail, fertility problems, not getting pregnant, not staying pregnant, miscarriage, not being able to tolerate a low worm load. In cases of severe copper deficiency, goats will die. You are more likely to have copper deficiency if you have well water that’s high in sulfur (stinky), calcium (leaves white film on everything), or iron (makes sink orange) because those minerals bind with the copper, making it unavailable to the goat. If your goats do have symptoms or you do have minerals in your well water, the best supplement is copper oxide wire particles (COWP). I recommend Copasure. Most injectable copper is peed out within 24 hours, so it doesn’t last as long as the COWP, which will last 3-6 months. Do NOT believe the company that says theirs lasts for 12 months. I know people who’ve used it and wound up with copper-deficient goats because they believed that company instead of paying attention to their goats. Hey! Do you have a certain brand of minerals you use that are safe and nothing harmful in them? Thanks! I like Sweetlix Meat Maker, which is available in most areas (check their website for dealers), but if you can’t find it, just be sure that you get one that is specifically for goats (NOT “sheep and goats”) and has around 1500 ppm copper in it and NO molybdenum. Also, I don’t like minerals that have more about about 15% salt in them because more salt means the goats will consume less of the mineral. You can find all of this info on the feed tag that it attached to the bag. I’ve seen a mineral with copper as low as 300 ppm and salt as high as 85%, which means the goat is getting mostly salt and practically no copper or anything else. I am fostering a boer buckling whose mama rejected him and another when she had triplets. The owner gave me dumor milk replacer and he got the runs so I switched to whole cow’s milk and half and half. He is 4 wks old now and also eats alfalfa and forage. Does he need access to minerals? Yes, goats need access to minerals from the time they’re very young. If they don’t have them, you will sometimes see them trying to eat dirt. Hello! I just want to say thank you for your post(s) on copper deficiency. We recently had to put a pet goat down because we could not keep her healthy. We had her about a year and a half-she was a retired dairy goat. From the time we got her we could not keep her healthy. She always struggled with parasites and would have spurts of good health and activity but was chronically lame without response to anti inflammatories. Her coat showed signs of copper deficiency early on so we did the COWP and a loose mineral. I, like you, worried about copper toxicity so we went to just the bolus and no loose minerals. CLEARLY SO WRONG. We consulted with fellow goat owners, paid over $500 in vet care just for diagnostic testing only to tell us there was nothing we could do except supportive care. Anti bacterial, tested for CAE, anti inflammatories etc. Eventually her health became so bad that we put her down. Not once did the veterinarian ask about minerals or copper. The pasture that our goats are on also happens to be where our well head is at and we have high iron/sulfur water. This all makes so much sense now! And while I feel terrible about not giving her the care she needed I feel like we finally have an answer and are able to change the way we care for our remaining goats. They are so far happy and healthy which was always so puzzling as to why our Doe could not get healthy. Thank you so much for your articles. I have some work to do to get our goats in order. This is SO ON POINT!! Dry does do not need grain or beet pulp. In fact, that’s a perfect diet for obesity. Beet pulp is mostly carbs and has very little nutrition. Grain is high protein and made for does in milk. Dry does only need good grass hay and pasture. (Good means green.) If they get obese, they will have trouble getting pregnant. I have boer wethers and struggle with their health. They don’t touch their loose minerals (Manna Pro). I do not give grain or alfalfa due to urinary calculi. (Dont want to risk it). My question is, how do I get them to want their minerals? I swear the minerals will go bad before they will take any of it. Is sweetlix okay for pet wethers? Sweetlix would be great for them. Are they showing signs of any mineral deficiencies? Pet wethers are very easy keepers because they’ve got a pretty stress free life and are not producing anything (sperm, milk, or babies). I am so happy to have found this page! I also have raised boer wethers, and have lost 2 due to urinary calculi… I have one boy left (5 years old) and I want to keep him healthy. He does not like manna pro either. What sweetlix do you recommend? There seem to be a lot of options and I’m not sure what to select. Thank you! If you have lost two wethers to urinary calculi, it could be because you are feeding grain. That is the most common cause of urinary stones in wethers. It would be much more important for you to STOP feeding grain than to switch minerals. If he’s not eating much minerals, it’s probably because he doesn’t need much. Wethers are very easy keepers. They are not producing sperm or babies or milk, so their nutritional needs are very minimal. They should have pasture, browse, and a good GRASS hay. No alfalfa (too much calcium and protein) and no grain (too much phosphorus and protein). I have never fed grain or any extras other than the occasional carrot or Manna Pro goat treats when I trim hooves. I did a lot of research before I even got goats and have been terrified of grains and alfalfa. They are strictly on pasture, grass hay and minerals otherwise. We did not have any issues until a neighbor, 3 years ago, thought it would be nice to feed them grain without asking first. Immediately they went downhill and never really recovered, even after the pizzle surgery. The remaining goat is the only one that never became seriously ill because his brothers bullied him so he probably did not get too many grains. They neighbor knows to never feed my animals a THING without asking me every single time now. Its good to hear that I shouldn’t worry if he’s not eating his minerals though. He’s doing pretty good. I did just get him 2 new friends, another boer wether (he’s 15 years old and acts like a young buck!) and an 8 year old doe. Thank you so much! Recently, my goats seem to have had issues absorbing copper (3 Nigerian Dwarfs and 1 boer/pygmy cross). They get about a cup a day (1/2 in morning, 1/2 in evening) of Dumor goat feed, mixed with some BOSS, and pumpkin seeds (some raw, and some salted, and roasted with Titanium Dioxide). I also sometime mix in oats (but I recently stopped doing that since I read it has a fair amount of molybdenum) and sunflower seeds. I sprinkle minerals on their food (which contain copper). They also have access to pasture, or given plenty of high quality organic hay. In the past, when I have noticed they are becoming copper deficient, I would give them a dose of Replamin Gel Plus and it would clear it up almost immediately. I have been trying over the last month to get them back on track and have given them all several doses of the Replamin, and there is no response. I tried getting them to eat some copper bolus by putting them in a treat (only two of them actually ate any) – but still not seeing any improvements after a few weeks. What am I doing wrong? I would also give them a better form of grain, but not much available in my (very rural) area. HELP!!!! Dumor Goat Sweet Feed is actually one of the best, although the Dumor Pelleted Feed has only about half as much copper. Which one are you using? You should NOT be adding minerals to the goat feed. Minerals should be available free choice so that goats can take as much or as little as they need. You could have pushed them into a mineral imbalance or a toxicity situation. Which symptoms are you seeing? Which mineral are you using? I really wish Dumor would change the name of the Sweet Feed to something else — like textured feed, which many brands call their textured feed — because “sweet feed” usually refers to an all-stock feed that contains no added nutrients and is just grain and molasses, and it should not be used. The Dumor Sweet Feed is almost identical to the Purina Goat Feed, which costs a couple dollars more. A specific color is not indicative of copper deficiency. What’s important is how the coat changed. What is normal coat color of the goat you say is now copper colored — and by that do you mean rusty? What is the normal color of the off-white goat? Curly hair is not a symptom of copper deficiency. Is color change the only symptom? Do they have hair loss on their face or fail tip (fish tail)? Are these does, bucks, or wethers? Do you have sulfur or iron in your well water? Are you feeding alfalfa or grass hay? I’m asking all of these questions because this may not be copper deficiency at all. Replamin Gel has several minerals in it, so it may have been correcting a different deficiency in the past, such as zinc, but I need more information. This does not sound like it’s necessarily copper deficiency. Have these does ever been bred? If yes, when? Even if does are not bred, they can bag up. It’s called a precocious udder, and it does not mean that anything is wrong. It just happens with some goats. When goats are copper deficient, their coat fades, so a white coat looking darker is NOT copper deficiency. A cream goat would turn white if it were copper deficient. A white goat has got nowhere to go because it already has no pigment in its hair. I am not talking about using medicated feed. Purina has several goat feeds, and Dumor has two. Neither of the Dumor goat feeds is medicated, and only one or two of the Purina feeds is medicated. There is NO need to give medicated feed to adults. We got our first two goats with one pregnant- who gave birth to our third goat. Then we rescued our fourth. So Only one of them has been pregnant. Her bag and her daughters are the ones that are looking full. Ok – I guess I was confused with the coat pigments and copper deficiency. It’s mostly on their legs and backend where the color change is taking place. And I guess I mean ‘rusty’. It definitely seems as though their coats have lost pigment – where this is happening is rough fur, compared to their normally soft, shiny coats. I will switch foods and have stopped putting minerals on their food. I am open to more suggestions- I just want to do what is best for their health. Thank you so very much for your help thus far – I truly appreciate it!!! Do you have sulfur or iron in your well water? Do you have minerals available free choice? What brand? No noticeable iron or sulfur in our well. We drink without filtering. Manna Pro minerals- yes I had it offered free choice and they never touched them. I have used Billy Block- which they loved- so I was thinking of going back to that brand. Since you are not breeding your goats, they have practically zero stress on their bodies, which means they don’t have high mineral needs. They are not producing milk, babies, or sperm, so they should be very easy keepers. You also have no copper antagonists, so they should not have secondary copper deficiency. A little rusty color around the back end is not a big deal. Goats with copper deficiency have multiple symptoms, such as no hair on the bridge of their nose or around their eyes and no hair on their tail tip. They don’t shed their winter coat. When it’s severe they have fertility problems, but your goats are not breeding, so that’s not something you’d be aware of. However, as I said, if they are not breeding, they don’t have high mineral needs. I’m concerned that they may actually be suffering some type of mineral overload or mineral imbalance because you’ve been over-doing it by putting minerals on their feed. Goats should have FREE CHOICE minerals available so they can take as much or as as little as they want. I would not expect your goats to consume much of the minerals since they are not breeding. The Billy Block is 93% salt and has very tiny amounts of minerals in it, so the goats were consuming a lot of it because it actually had very little minerals in it. Manna Pro has about 6x more copper, so they have to consume six times as much of the Billy Block to get the same amount of copper. Since none of them are breeding, they really don’t need grain, and in fact, you could start to have problems with obesity in the does if they’re not bred and you keep giving them grain. Only does in milk need grain. I’d suggest weaning them off the grain and just providing a good quality grass hay, as alfalfa can wind up causing zinc deficiency in non-breeding does, bucks, and wethers because of the high calcium content. And they need to have a loose mineral available free choice. We got our first two baby goats yesterday, males 9 and 10 weeks old. I bought the divid d mineral feeder. Today I read instructions on the bag and measured out 1 Oz. and divided in feeders. Unfortunately the slightly bigger baby ate most of it. Should I put more in there and have it available at all times? Will they only take what they need? Also besides their goat feed should I provide free choice hay? They are in a fenced in area about 50 feet x 75 feet with lots of grass and a few trees. I have watched them eat grass, certain leaves, weeds and some pine needles off the pine trees. Thanks, appreciate any info I can get. Goat minerals should be available free choice, which means that you put a cup or so of the mineral in the dish and let them eat as much as they want. Goats will regulate their intake appropriately. If they have not had minerals available for awhile, they might consume more for a few days but then slow down. That’s not a very big area, and two goats will eat everything in there fairly quickly. Since they’re still young, it might be enough for them this summer, but as they get bigger and eat more, they will be able to eat everything in an enclosure that size in most parts of the US. Hopefully the trees in there are mature. If they are young, the goats will kill them as they eat the bark. They will definitely need a good grass hay in the winter as things slow down and stop growing. Hi. My 3 month old Nigerian Dwarf wethers didn’t seem to be eating their minerals, so I have measured out a recipe, stirring until it appears equal parts are distributed and re-measuring for serving it up, to be sure they are getting the 1/4 oz per day. 2.0 oz MannaPro Goat Min. Manna Pro is a 2:1 Calcium/Phosphorous ratio, and I understand 3:1 is ideal. I’m not sure how to figure out my for the % listed on the bag, but the molasses adds approx 9 mg/ calcium serving. You mentioned not mixing the minerals with anything. Im thinking that if I measure it out in this way, it will work. Is that correct? Also, Manna Pro does not have Iodine in it. Is this a problem? I feed them hay and only a small small bit of grain to top of their mineral treats. I’m not surprised that it doesn’t look like 3 month old kids are not consuming much minerals. That’s totally normal. Minerals are supposed to be free choice because needs vary from place to place and goat to goat. A milking doe has higher needs than a buck, and a buck has higher needs than a wether — and 3 month old kids need far less minerals than adults. Wethers are VERY easy keepers and do not usually need much for minerals. You should not be doing anything to encourage them to consume more minerals than they are willing to eat on their own. You could wind up with some type of mineral toxicity. Wethers also should not have grain because it increases their risk of urinary stones. Manna Pro is fine for wethers, although I would not recommend it for breeding animals. Good article and lots of good comments. I have two goats saved from the butcher for pets. They have an acre of land to graze on. I don’t know about the copper need but they ate the wiring harness off of my mower and I think they ate a pair of meter test leads too. couple of years ago , no sign of problems with them. What feed do you recommend? It is hard to find anytging other than Purina in my area. Purina Goat Chow is a good choice because it has around 40 ppm copper. Other Purina feeds only have about half that much. Dumor Goat Sweet Feed also has about 40 ppm, but the pelleted Dumor Goat has about half as much also. Just check the feed tag and look for 35 to 40 ppm copper. Most goats feeds only have about 20 ppm copper. The Purina one at the stores is labeled as “Meat Goat”, is that the same as “Goat Chow” and would you also give mineral supplement of Sweetlix? Meat Goat is medicated. You need to read the tags to be sure that you are not getting medicated feed, AND to be sure you are getting one with enough copper. Yes, ALL goats need free choice minerals, regardless of what they are being fed. Thank you foor your help! Would you recommend Chow over Meat Goat? Also what would your top brand recommendation be, Purina or otherwise? Already put in an order for the Sweetlix mineral you recommend. HOWEVER, are you sure your goats need grain? Most do not need grain. Really, only does in milk need grain. Very young, fast growing kids can utilize grain, but they don’t really need it if they have plenty of good browse and are nursing. Grain is actually detrimental for wethers and bucks as it can cause urinary calculi, and dry does can wind up overweight if they eat grain. Hi Deborah, thank you for all of your detailed responses. Truly your blog is by far one of the best resources I have found. Regarding your note back above, living in Florida we have a major issue with ants and sweet feed. I spoke with my feed store who thought it would be a bad idea to switch to Goat Chow because of the ant possibility. What is your opinion? They sold me a bag of Nutrina Pelleted Goat feed, but looking at the bag it is medicated as well. My Nigerian Dwarf Goat (two years old) is a companion to our horse – by far she rules the roost. I purchase the Sweetlix you recommended, but she doesn’t seem to eat it at all. She literally tosses the bucket over. Our yard is comprised of bahaia grass a few oak trees, and weeds, like most pastures in Florida. She also steals timothy alfalfa or orchard alfalfa from our horse’s stall too. We don’t plan to breed her, nor has she ever been bred. With all of this info, do you not feel it is necessary to do feed? I am just worried she wouldn’t get enough of the vitamins listed in the feed bags. Our horse vet who is familiar with goats said she looks healthy. Sounds silly, but I feel really guilty not giving her feed when she sees her horsey brother eating feed. Dry does do NOT need grain. And even if you had goats that needed grain, you would NOT leave out an unlimited amount for the ants to crawl into. They get such a small amount that they eat it up in a few minutes. If you have not opened the bag of medicated feed, I’d suggest returning it. Goats don’t exactly “eat” minerals. They lick at them once or twice a day. With only one goat, you are not going to see much disappear at all. And since she is a dry doe, her nutritional needs are minimal, so she will consume even less. You don’t put it in a bucket. You would just put a quarter cup or so into a mineral feeder that’s attached to the wall, and when it’s gone, add another 1/4 cup. If she isn’t consuming the minerals, it’s because she doesn’t need them, so you shouldn’t feel bad about not giving her grain. It will just be calories that she doesn’t need. Would you advise a filter on the goat’s water bucket end of a hose? I have a high Iron & mineral well water.. I wish it were that easy to eliminate high minerals from well water. You can reduce iron with a water softener, but reducing sulfur requires the use of a water filtration system that costs a couple thousand dollars. I currently have 4 goats and a calf together. Is there a certain loose mineral that I could offer that would benefit/not harm them all? Goats and cattle have mineral needs that are so similar that you can use their minerals interchangeably. Some cow minerals have more copper in them, but that is not always the case. Our goats always needed far more copper than our cows did. Some people purposely feed a cattle mineral with 3000 ppm copper, although I am not comfortable with anyone doing that unless they tried a typical goat mineral with copper around 1800 ppm and found that they were needing to bolus their goats with extra copper every three months. In that case, they might try a free choice mineral with more copper. Basically they use the higher copper level mineral so they do NOT have to do extra copper oxide wire particles any longer. I need help. We just got two 5 week ago baby Nigerian. They were baned when we got them, now that I have been reading sound that it was to early. And told to give them hay/ and alfalfa. Very worried now. Five weeks is not that bad, if it was just done when you picked them up. I won’t castrate earlier than 4 weeks, although I prefer 2 months. But the difference between 4 and 8 weeks is not enough to lose sleep over. Hopefully they are still getting a bottle, which they need for at least 8 to 12 weeks, depending on how fast they grow. Babies are fine on alfalfa because they are growing so fast. They need the extra calcium and protein right now. That is also why they need milk — lots of calcium and protein. But you should start to switch them over to a grass hay by the time they are about six months old because their growth slows down considerably by then, so they no longer need that much calcium and protein.